‘Batman v Superman’: Has the World Turned on the Man of Steel? One demand that fans had after last year’s Man of Steel was for Superman to have to face the consequences of the damage done in his fight against Zod. I actually thought it was necessary and he did the best he could if you think about it. Superman and Zod were pretty much evenly matched, so Superman couldn’t really take him out to space instead of causing damage on earth. Zod’s was also justified because it was the only way to save that family. Regardless, some new set photos show the world turning on Superman and not embracing him as their savior. 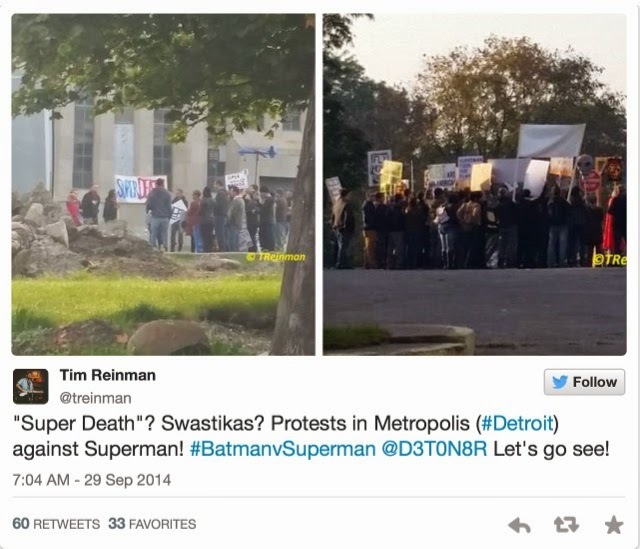 From the set pictures above taken by Twitter user @treinman, we can see some anti-Superman signs and protests going on. What’s most interesting about one particular image is one sign appears to say “SuperDeath”. There have already been rumors of Doomsday being the other villain in Batman v Superman. In the comics, Superman eventually stops Doomsday, but at a price: his own life. This seems to be a little early to be using the Death of Superman storyline. If he does indeed die, the question is will he back for Justice League. If I had to guess, they would find some way to bring him back. He’s just too big of a part in the DC comics to be taken out of the Cinematic Universe that fast. It’s not for sure that Superman’s going to die. Another possibility is that the citizens are just calling for his death. That would make a little more sense in terms of Warner Bros. wanting to build their franchise, but a risk like the death of Superman could also separate it from the Marvel movies, which haven’t killed off one of their core superheroes yet. Batman v Superman: Dawn of Justice is scheduled for release in March of 2016. Until then, make sure to check back here for more updates on the film.